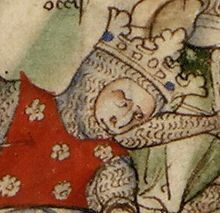 13th-century portrayal of Harald Hardrada, from The Life of King Edward the Confessor by the English chronicler Matthew Paris (c. 1200 – 1259). Harald III of Norway (1015 – September 25, 1066) was born Harald Sigurðarson, but known as Harald Hardrada. He became rich as commander of the Varangian Guard of the Byzantine army. When Harald returned he fought and became king of Norway. He also fought to be king of Denmark but failed. He thought that he was the rightful heir to the throne of England. In 1066 he invaded England and fought and won the battle of Fulford. He was killed at the Battle of Stamford Bridge by the army of Harold Godwinson, the last Anglo-Saxon King of England. Publications - which have some traits of fairytales - by Snorri Sturluson (1178-1241), say that a Sami woman, Snøfrid married Harald Fairhair; furthermore, none of her children or grandchildren became kings; first when Harald Hardrada became a king, then her blood became part of the blood of the royal family. ↑ Frode Korslund. "Stammor Snøfrid?" ["ancestress Snøfrid?] (2017-July-24) Klassekampen. p. 16. "Frode Korslund, cand. philol." This page was last changed on 21 November 2018, at 02:58.